e love virtual reality. Unlike any other technology or screen, VR can make you feel like you're somewhere else. Without a ticket, you can get front row seats at Coachella and visit a world-renowned museum to see extinct animals come back to life. You can take field trips to almost anywhere and capture vivid moments you can revisit anytime. It’s transporting. We’ve been working with developers, smartphone companies and content creators to make the dream a reality — and now, we’re excited to share updates across the three key elements of Daydream: smartphones, headsets and VR experiences. Yours. Daydream View is designed with choice in mind. The headset fits phones big or small, so it’ll work with any Daydream-ready phone you choose. Enjoy the best of Google. We’ve brought some of the most popular Google apps into VR. With YouTube, you can watch the entire library of videos on a virtual big screen and experience immersive videos from creators like Buzzfeed, PrankvsPrank, Meredith Foster, CollegeHumor, Tastemade, UnboxTherapy and VSauce2. Use Google Street View to see curated tours of more than 150 of the world’s most amazing places like the Pyramids and the Taj Mahal, or just search to explore everywhere else. Google Play Movies makes tens of thousands of movies and TV episodes available in your own virtual theatre. And Google Photos displays your 360° captures in a whole new way. Kick back in your own personal cinema. Experience sports, live events and more with MLB and NBA. Plus, you can watch top shows and movies on your own virtual big screen with Netflix. 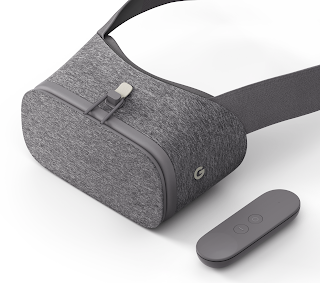 Daydream View arrives this November at the Google Store and Bell, Rogers, Telus and Best Buy Canada for $99.